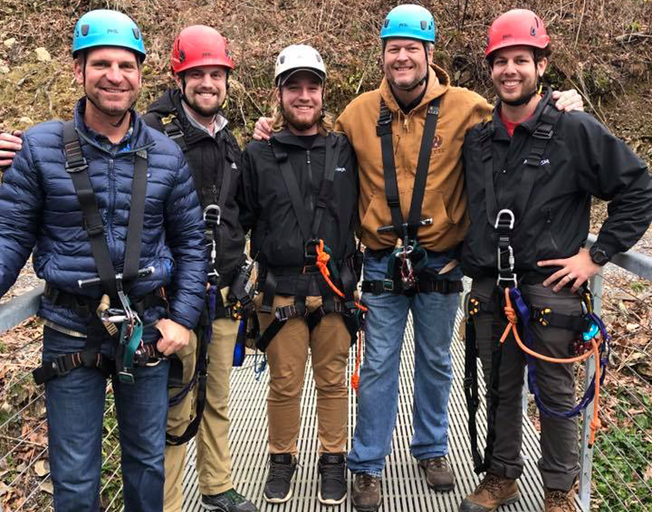 Why do Blake Shelton and Clint Bowyer look like they are training to become linemen for the power company? Don’t work country music and NASCAR fans. The two friends are not changing careers. They were simply having some fun together. Blake and his girlfriend pop music star Gwen Stefani have been spending time with Clint and his family as 2018 ended and 2019 begins. The group of friends were seen Wednesday (1/2/19) at the Anakeesta Theme Park in east Tennessee. Located just outside of Gatlinburg, the park boasts activities like gondola rides, tree canopy walk, tree house village playground for the kids, a mountain coaster, gem mining and even a zip-line … all in the Smokey Mountains. The park shared pictures of the stars on their Facebook page during their day of fun. As you can see by the post from the theme park, Blake will be opening the third location of his signature bar and grill named “Ole Red” just across the street from the park very soon. Blake’s other locations for Ole Red are already open in Tishomingo, Oklahoma (his hometown) and in Nashville. Blake will be back on The Voice for season 16 premiering February 25th on NBC. His “Friends and Heroes 2019” Tour will make a stop at the Peoria Civic Center Thursday, February 28th. Get concert and ticket details here.